Wolf Creek Care Center now offers intensive Medical and Physical Rehabilitation Care for patients and residents recovering after a hospital stay. Focusing on Post-acute care with a full range of medical care services including wound care physicians, physiatrists specializing in pain management and rehab, and psychiatrists that help support the individual’s continued recovery from illness including management of a chronic condition. The function of post-acute care is to provide for the medical and emotional needs of people who are well enough to be out of a traditional hospital setting but not well enough to return home. Following a hospitalization for injury or illness, many patients require continued medical care, either at home or in a specialized state of the art post-acute facility like Wolf Creek Care Center. Post-acute care involves rehabilitation, such as physical, occupational therapy or speech therapy. Through our full complement of highly trained Medical Care Staff, Wolf Creek Care Center offers patients and residents the opportunity to regain their highest level of functioning prior to returning home. For many of these patients, however, a quick recovery is unrealistic. They need continued care – post-acute care. Helping a patient perform daily routine tasks such as eating, bathing and dressing as well as administering medications and monitoring vital signs is also included in post-acute care. At Wolf Creek, our highly acclaimed physician-driven programs are designed to attend to the individual needs of each patient and resident through a customized Treatment Plan, ensuring maximum recovery potential. 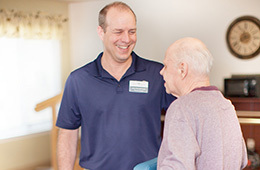 Post-acute rehabilitation at Wolf Creek Care Center is provided by our highly trained professionals committed to ensuring the highest standards of the post-acute spectrum allowing us to achieve our goal of helping patients recover to the fullest by providing care in the proper setting.